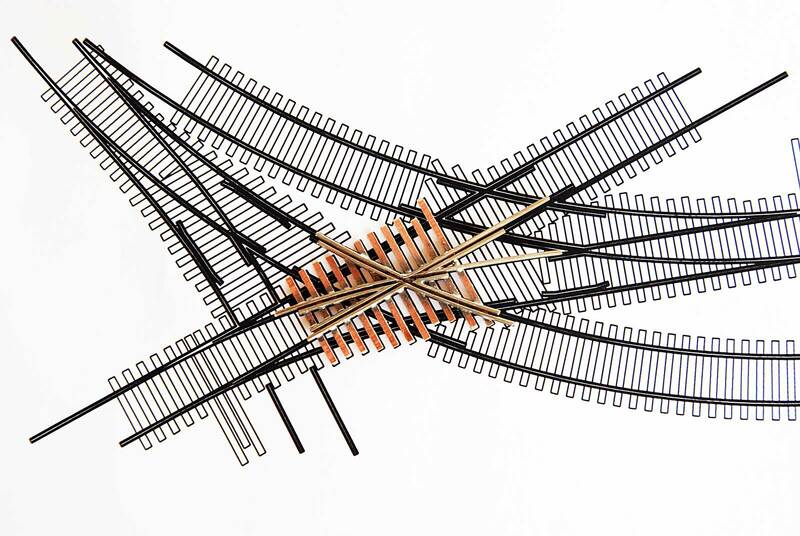 Ok, its not the first piece of N scale trackwork here. This is the section of the terminal I have been referring to as “Part 1” so thats what I titled this post. Part 5 in N scale has already been built. Thought I would carry on with another section in N scale code 40. Next to the quad diamond the most complex piece of trackwork is the triple lapped turnouts leading into the engine house/car float apron/yard tracks. In the centre of this mess is a complex frog where the three turnouts intersect. This was pretty difficult to do in HO code 70 and I wasn’t sure it could even be done in N so I thought I would do a test build of just this frog before sinking a bunch of time into the entire piece. It turned out well so I guess it can be done. I’m glad I did a test on this piece as there a small flaw in it that is bugging me that I will take note of when I build the entire piece. Can you spot the flaw? Yes, the point on the end of that rail was mistakenly ground off, creating too wide a gap. Good eye! The “flare” on the end of that rail was intentionally omitted, I know I would not be using this so didn’t bother to add it. I’m sticking to that story…. You do know FR will be re-releasing their Z scale boxcabs in 2008. I was wondering when you when finally do something challenging like n scale…..
Actually, after following your progress for a while in HO, and now that you are dabbling in N (which is my chosen scale), I guess I don’t have a good reason not to try handlaying N scale code 55. it was a lot easier last week to justify it as just too much to try in N…..guess I should start looking at the jigs…..
A fascinating piece of trackwork! I handlay in N myself and have done a few complex pieces, but nothing quite like this! My question is how do you intend to gap this? I know you intend to wire this analog (I’m DCC) but the gaps would be the same either way! Also, any thoughts on wiring? I have worked out all the necessary gapping when doing the initial design of the track sections. It is all possible, and will work with either DC or DCC. I started gapping some of the diamond, but found it was getting weak and decided to leave it until it is installed. The gaps are cut with a jewelers saw, which allows me to insert the blade between the ties and carefully slice the rail. In some cases it will be necessary to cut the tie as well. After the gaps, lots of feeders will be ran from the various switch machines that will drive the turnouts. 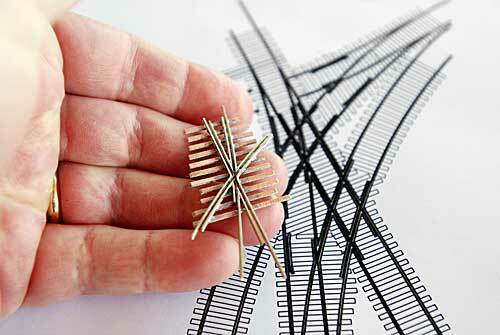 These will be controlled with a computer to reduce the complexity of the trackwork.